People for Guatemala has had a profound impact on the lives of thousands of people living in San Martin, Jilotepeque. We couldn't be prouder of our accomplishments and couldn't be more thankful for your help, support, kind words, hugs and encouragement. 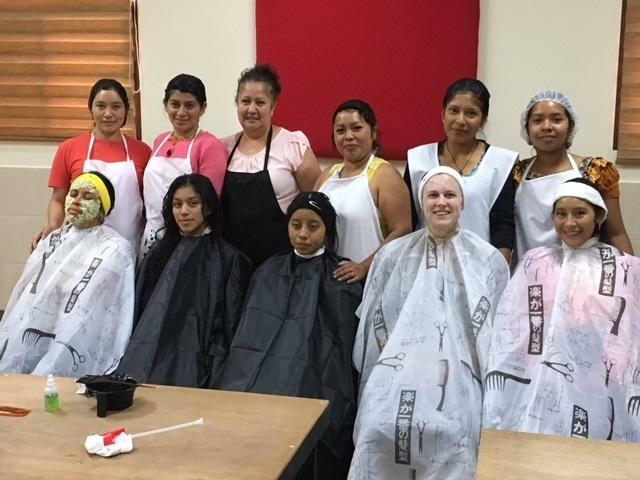 Team work includes caring for each person who walks through the clinic door, for every young person in our scholarship program, for adults taking classes at our Learning and Skills Center, and for each community seeking support. Our mission is to provide you, our donors, the best possible return on your investment. We are confident we are accomplishing that every day. Working together creates productive communities, healthy families, and educated young adults. And....we're staying! In other words - hope, knowledge, support and sustainability. There's more to do! 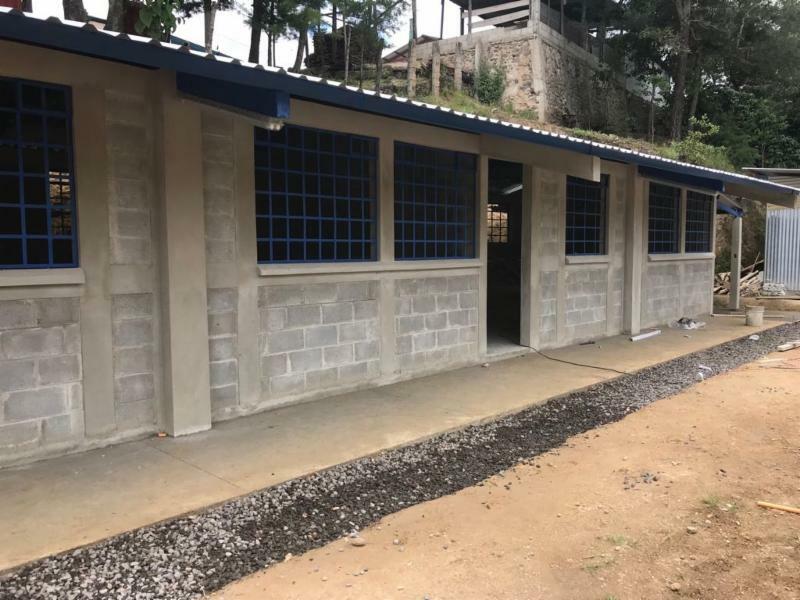 More patients to treat, more students needing scholarships, more villages requesting grants, more children lacking vitamins and proper nutrition, more mom's needing health education, more adults asking for vocational and technology training, and more women asking for literacy programs. Yes, Lois still wakes up in the middle of the night and prays. 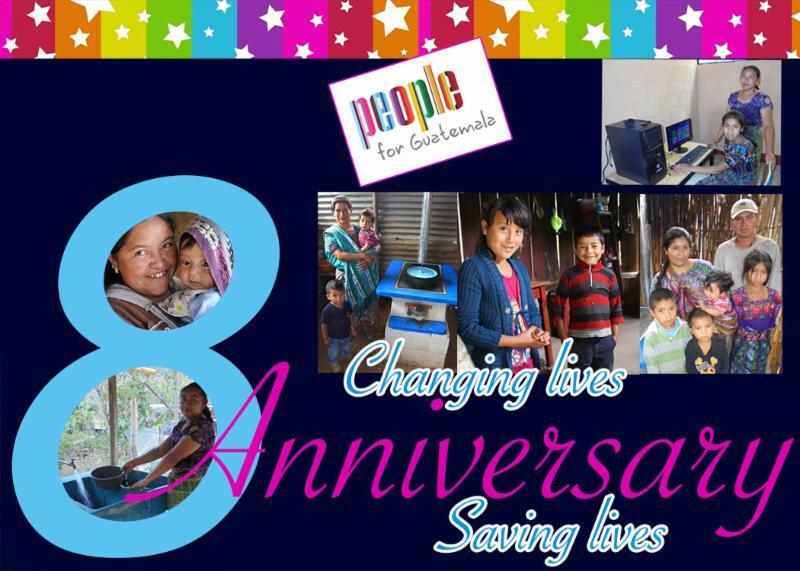 Please celebrate with us and continue changing lives and saving lives everyday. Creating partnerships with people living in rural villages results in pride, productivity and their ownership of each project. We listen and help them prioritize their needs and assist them with grants to improve their communities. In 8 years, over 125 villages have benefited from community grants. Junior high school in Palo Blanco under construction. to make plans to build their first junior high school. “I always wanted to learn to sew” said Silvia the day we met her two years ago. 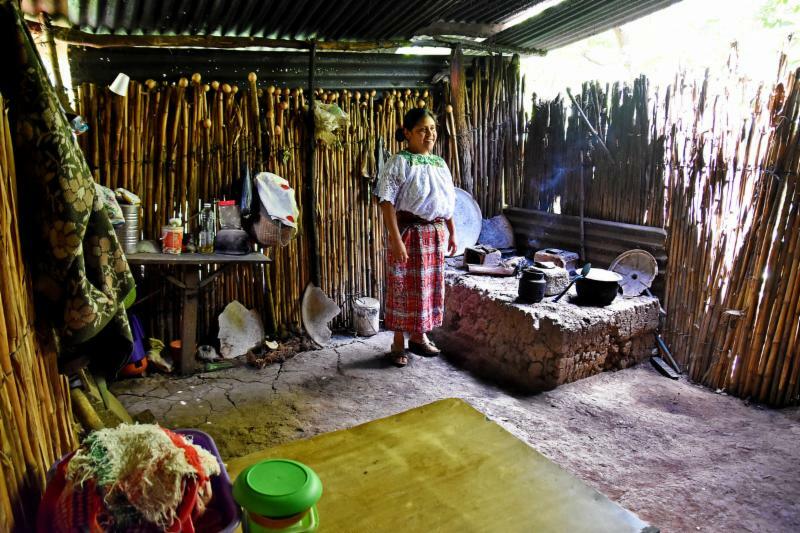 She lives in Pacoxpon with her husband and their two sons. Silvia, age 28, attended elementary school only through third grade. Silvia didn’t have an opportunity to attend school until January 2017 when our Women’s Learning and Empowerment Project literacy classes started in her village. “I forgot what I learned in school. I could only add and subtract small numbers and read short words" Silvia commented. Besides attending literacy classes in her village, she made the two hour trip each Tuesday to our attend sewing classes. She breezed through beginning and intermediate classes. She purchased a sewing machine through our micro-credit program and opened a business in her house to sew for her neighbors. She now teaches four sewing classes each week at our Learning and Skills Center. This extraordinary woman is an example that dreams really can come true when given an opportunity. 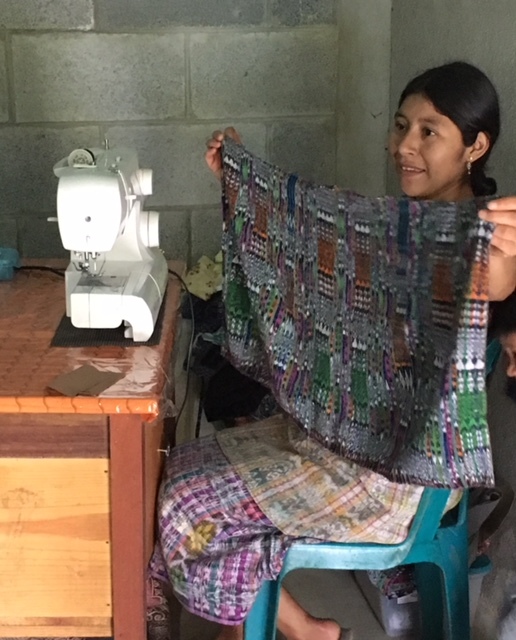 Participating in our Women’s Learning and Empowerment Project gave Silvia an opportunity to advance in school, gain self-esteem, open her own business, earn an income, and teach others how to sew. Above, women in Pacoj attend literacy classes twice a week. not knowing how to read or write. Now I can help my daughter with her homework." 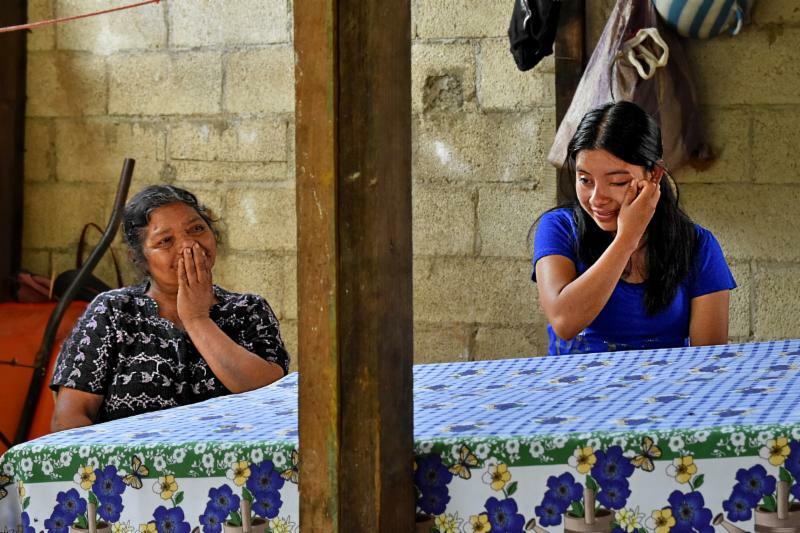 "I HAD TO LIE TO MY MOM SO I COULD GO TO SCHOOL"
Casilda's father died when she was two months old leaving her mother to care for six children alone. Her mother had no education and no means of income. Their shelter was a one-room shack with dirt floors and walls made of corn stalks. Neighbors sometimes helped feed the kids with leftover tortillas and coffee to ease their hunger. Her brothers didn't go to school because there was no money. They left the village to find work anywhere they could. 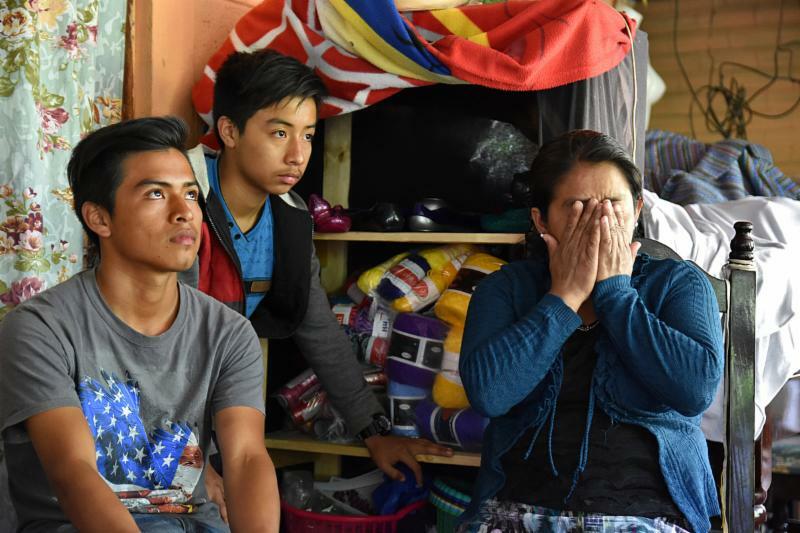 Casilda ignored them when they told her she was wasting her time wanting to go to school. 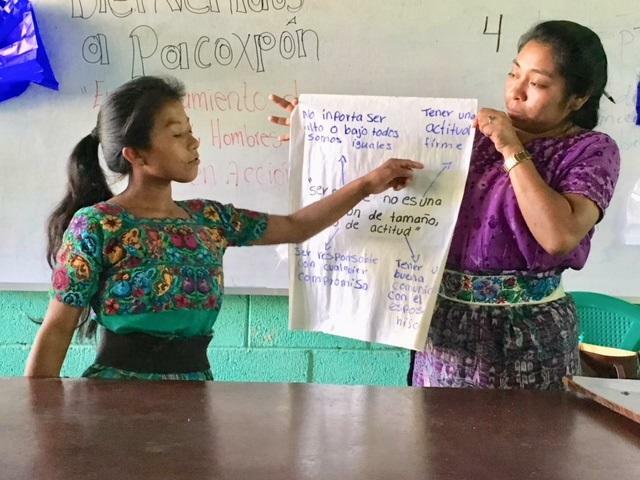 Through shear determination and working when she could, Casilda finished 6th grade. But that's where her dream ended. For the past 10 years she wouldn't talk about her desire to go to school with her brothers and mother. There was no financial or moral support from them. about their lives and express how grateful they are for Casilda's scholarship. Casilda worked in the fields hoeing corn and beans or sold fruit drinks and tortillas in the street by their house. She secretly saved what money she could. "I lied to my mom the day I registered at school" said Casilda. "If I told her the truth she wouldn't let me go." In January, 2018, she started 7th grade. She is 22 years old. 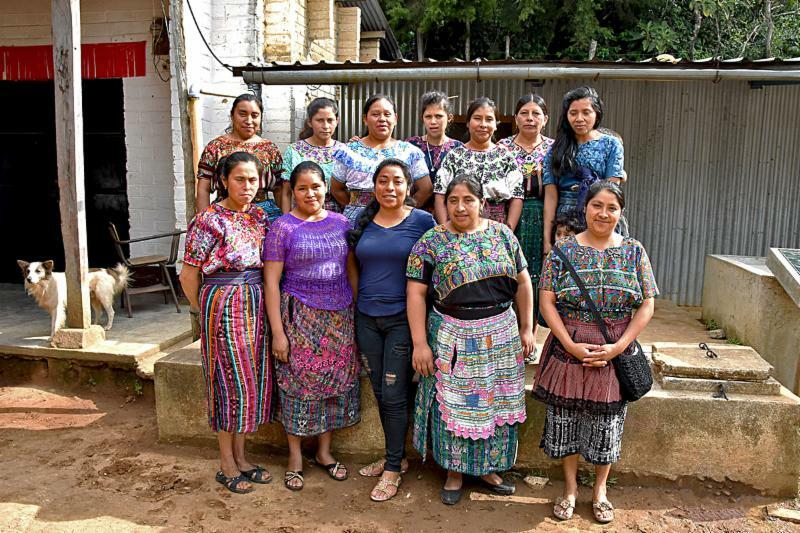 The daily struggle of poverty and no support from her family proved devasting to Casilda when she realized what little she saved was not enough to meet her school expenses. "A friend told me to apply for a scholarship" said Casilda. "I was scared but I knew it was my only chance to go to school." She was awarded a scholarship and earns excellent grades despite the difficulties she faces. This year 93 students are receiving financial help, medical care, and psychology counseling. We realize many of the students and their families endure unimaginable hardships including living in houses with dirt floors and no electricity, open fire cookstoves, insufficient food, no medical or dental care, abuse, no employment, and no financial resources . We are expanding our support to assist these families so their lives are more productive, healthier, and the children can stay in school. Alex's mom is sick but doesn't have money to pay for medicine and surgery. The kitchen in Rosa's house. Mom and seven children live here. 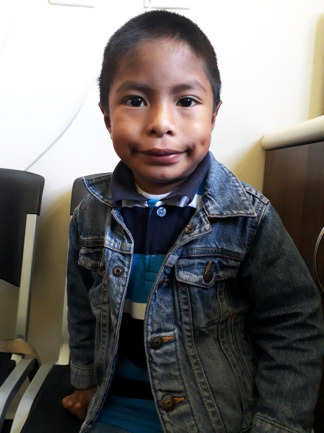 July 17 was a normal Tuesday at the clinic until Kevin arrived. A quick assessment by Dr. Garcia revealed hyperthermia. Kevin and his friend, both 5 years old, were playing at school and jumped into an open well. The teachers did not know the boys' plight until other students heard Kevin screaming. One of the teachers pulled Kevin from the well. He was barely breathing. His friend, however, drowned in the well. Mom held Kevin tight on the back of a motorcycle riding to the clinic 25 minutes away where our health team treated him and called an ambulance. He was transported to the nearest hospital one hour away. After his five-day stay, he returned to our clinic to thank the team for saving his life. visited the clinic to say "thank you"
Lois' mom, Gerry Dunn. passed away on August 2, 2018 in Clare, Michigan. She was 101. Gerry will be remembered for her love, wisdom, kindness and compassion toward others. In 2008, she was honored for 35 years of volunteer service at the Clare Hospital. She was a devout Catholic and a member of St. Cecilia Church in Clare where she volunteered for 65 years in many different capacities. She was always ready for an adventure and enjoyed traveling with Lois and Ken. She visited Guatemala in 2005 and again in 2012. In memory of Lois' mom, contributions can be made to People for Guatemala. 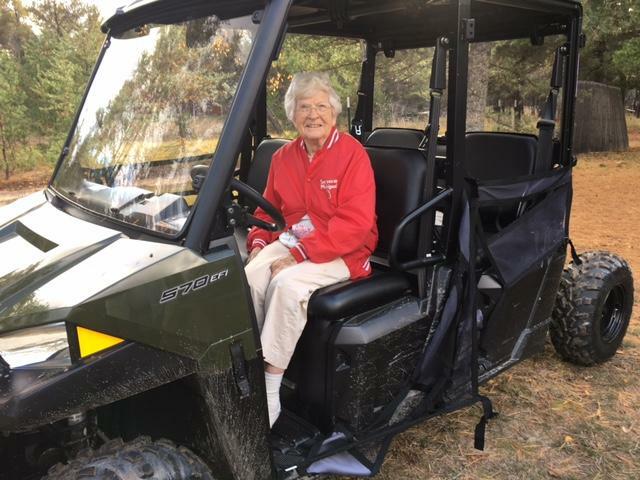 Lois' mom ready to go for a ride on "Bubba II" at the cabin in Northern Michigan, October 2016. 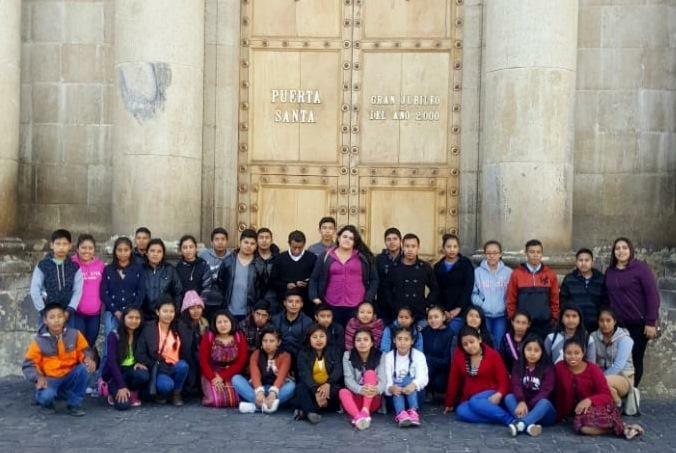 Students in our scholarship program have never seen Guatemala City even though it is only 45 miles from San Martin. 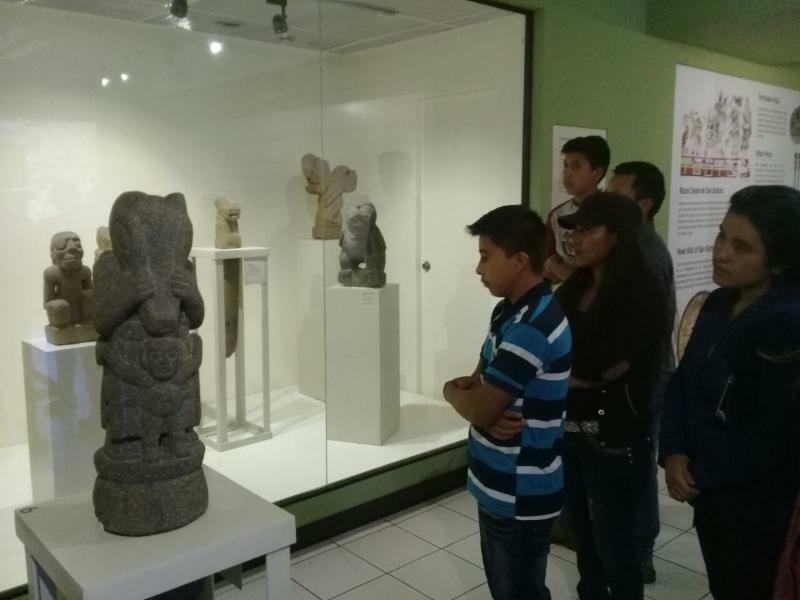 In July, the students had the opportunity to see the government palace, the Cathedral, Central Park and the Museo del Popol Vuh where they learned the history of their Mayan culture. 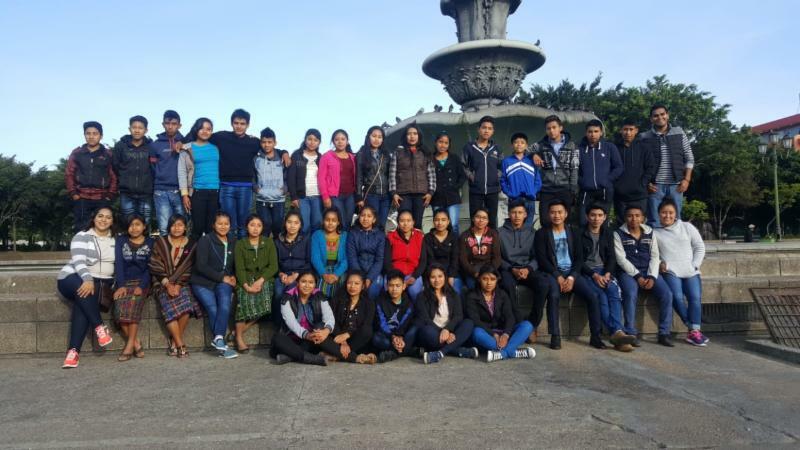 This valuable experience gave our students a better understanding of Guatemalan history, their ancestors, current events, and awareness of what is available outside of their village. Learn more about what we do. Visit our website.